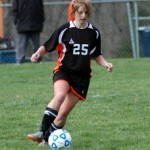 The Tiger’s visited Hillcrest today and faced an early District challenge against the Hornets. The key difference between these two teams at the moment is the scoring capabilities the Tiger’s have discovered in their freshman class. 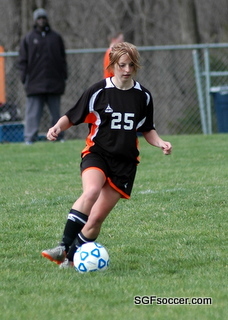 The Tiger’s took the lead in the first half from Tabitha Iles, who also scored the last goal today. The second half saw freshman Sierra Casagrande extending the lead with a direct kick from 26 yards that flew straight into the upper corner of the net. 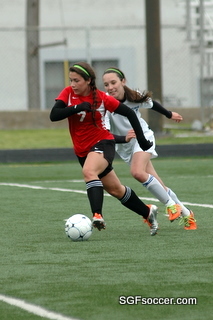 Senior captain Sam Minor was credited with the 3rd goal, scored from a scramble inside the six yard box. This is a good Hillcrest team, with some key components in place. I’ll have more details once I have a roster. Camdenton took a first half lead, on Freshman midfielder Whitney Snow’s direct free kick in the 37th minute, only to see Nixa come from behind to remain undefeated. 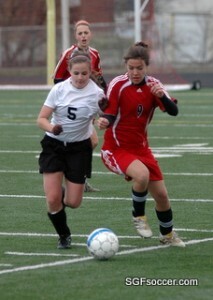 Jr Lauren Moats, assisted by Abby Turnbull, got the 1st goal for Nixa. 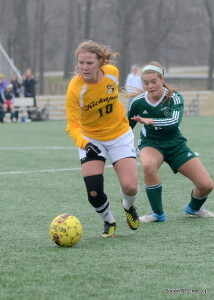 Paige Townsend got the game-winner, assisted by Kelsey Bartell. A lively game this evening as the Bulldogs shrugged off Saturday’s loss and came out strong against Warrensburg, who will battle Harrisonville and Bolivar for the Class 2 District title. The Tigers have a pair of forwards that any team would benefit from, both front runners with a nose for the goal (#8 and #11). The game was 3-0 when I arrived late in the first half but it was Central who were pushing forward regularly. Freshman Aspen Hawkins and sophomore Lauren Zeh run the midfield for the Bulldogs and the pair never stop moving, and seem to have already evolved an unspoken communication, despite only a month together. With freshman Analyn Salvato up top, the trio are as fast as any three players in the region. 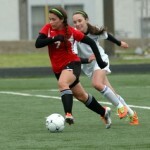 Their goals exposed Warrensburg weakness, which is a lack of pace. The first goal came late in the first half when Aspen’s direct kick from 30+ yards escaped the keepers initial effort to corral it and Salvato was there to bury the rebound. In the second half, Hawkins simple through ball allowed Zeh to outpace the defense from midfield and as she does regularly, despite the keepers diving attempt, Zeh kept the ball in front of her and slipped the rebound into the empty net. Warrensburg is an experienced team and midfielder #7 seems to set the tone for the Tigers. Play simple, let the ball do the work and exploit their strength up top. She also contributed a goal of her own when she hammered a half-volley that had bounced out to her, burying it high and away from the keeper. A good road win on a cold and blustery day that will prepare them for District play. Game determined by the wind. Ozark had the wind in the first half and went to the break with a 1-0 lead on a goal by Jackie Wacha assisted by Mollie Killion. Catholic scored 4 in the second half with the wind. Bekah Bade assisted by Shelby Hatz, Emily Ortega assisted by Natalie Smid, Nicole Ortega assisted by Hatz, and Smid from a penalty kick. The Warriors are benefiting from the decision to combine their sports programs with College Heights Christian last Summer. Rather than dressing 10 as they did at times in 2010, they have a full bench and the ability to get out and compete for 80 minutes now. Goals this evening came from Sammy Graham (2), Ashton Gilliam (2), Lucy Borgmeyer and Ally Adrian. Candy Lake and Annie Carter combine for the shut out in goal.